To reduce online piracy Google has implemented several changes to its search engine in recent years. Among other things, the search engine blacklisted dozens of piracy-related terms from appearing in its Autocomplete and Instant services. Both 'BitTorrent' and 'uTorrent' were included from the start, but TorrentFreak has learned that Google recently unbanned these keywords, resulting in a sharp increase in search traffic. For two years Google has been filtering “piracy-related” terms from its ‘Autocomplete‘ and ‘Instant‘ services. Google users searching for terms like “The Pirate Bay”, “RapidShare” and “isoHunt” will notice that no suggestions or search results appear before they type in the full word. While no webpages are removed from Google’s index, there is sharp decrease in searches for these terms. What triggers a keyword to be included in the blacklist is not clear. A Google spokesperson told TorrentFreak two months ago that they remove terms that are “closely associated with piracy” without providing further details. Over the past several months BitTorrent Inc. has continuously emphasized that BitTorrent does not equal piracy, and a recent upgrade to Google’s search filter show that this effort has paid off. Both BitTorrent and uTorrent are now absent from Google’s piracy filter and as a result searches for both terms spiked, resulting in an increase in visitors to the respective sites. “This is almost certainly a result of that improving understanding helped by products like BitTorrent Bundle and BitTorrent Sync. They help those who are confused about BitTorrent understand that it is not a piracy website,” a BitTorrent Inc. spokesperson told TorrentFreak. As far as we’re aware this is the first time that Google has removed terms from its search filter. Interestingly, Megaupload still remains blocked even though the site has been offline for nearly two years. Unfortunately the reasons to include or remove certain terms remains a mystery. Recently Google added the name of the popular music streaming service Grooveshark, which has had its fair share of legal troubles in recent years but is currently licensed by several of the major labels. While some people worry about possible over-blocking, the copyright holders have been arguing the opposite. Just last week the MPAA released a report claiming that Google and other search engines are major piracy facilitators, and that they should step up their anti-piracy efforts. 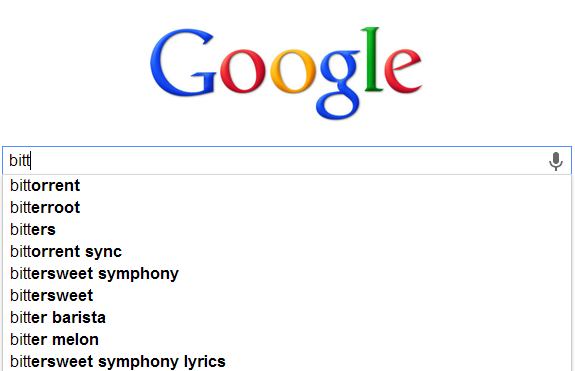 It’s now up to Google to find a balance between these two forces, which may prove to be quite a challenge. Update: added a comment from BitTorrent Inc.
What’s That Torrent Thing Google Keeps Suggesting?